Looking at the past can tell us quite a bit about the future. For example about the best time to book that cruise. We love to combine data and cruises. That’s the reason we do analyze the cruise price history of all trips every day and every second. We have done this for years and have amassed a treasure trove of data on the cruising industry. Our collections gives us great knowledge of the price itself and how it fluctuates over time. This can be a great help to you when booking your cruise! How does the cruise price history help me? No one likes the feeling of booking their cruise at yesterday’s best price and then discovering that others have booked it much cheaper. We can help you avoid that situation. One thing we do is compare websites and prices in real-time to get you the best deal available. But we have also found that the biggest savings come from booking at the right point of time. We can save you a lot of money by showing you the best time to book. Our cruise price history is unique per ship. To see it in action and learn how it can help you save money, just click the linked ship’s name and go to the “price history“ layer in our ship selection. 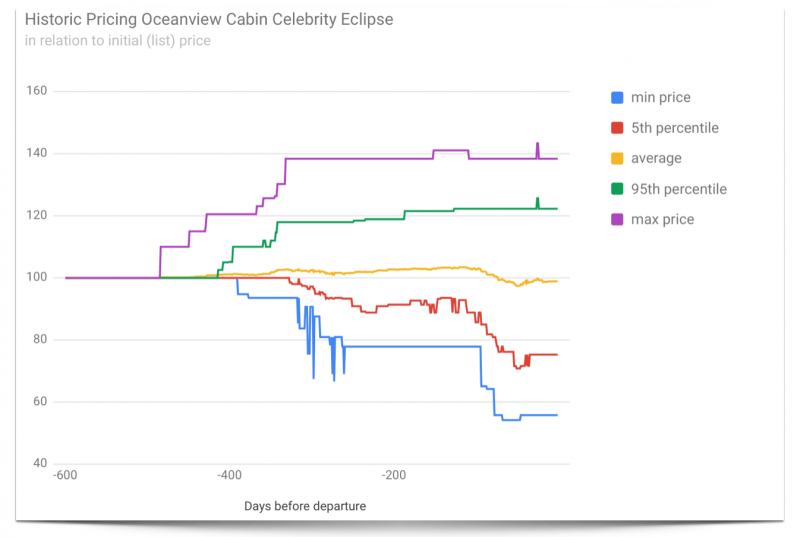 The chart shows you the historic pricing for oceanview cabins on Celebrity Eclipse. You can see how the pricing changes over time with the left hand side of the graph showing 600 days before departure and the right hand side being departure day. We have normalized all pricing at 100 so that you can see price drops and hikes. The orange line is the average pricing line with the other lines showing statistical boundaries. In this example, the pricing trend is generally upwards in the beginning with moderate increases of about 3%. Price reductions start about 60 days before departure with the lowest pricing around 40 days. Of course, this is just the average. Cruise pricing will always be impacted by individual demand and supply. As you can see, there are sailings that have significant price increases fairly early. Such sailings are typically in high demand seasons (such as public holidays). And there is also a very active last minute season with strong pricing drops about 90 to 25 days before departure (red line). Keep this in mind when looking at current cruise prices and check out the pricing history of the ship you are interested in. To do this, browse through the cruise lines, pick a ship, click on “analytics” and then choose a cabin type. Will I Have to Check Prices Every Day? Not at all. We offer a next generation alert service. Simply choose your relevant set of cruise trips or cabin types and then define when and why you want to receive alert messages. We can send an alert, for example, only when the cruise trip now offers its best price ever or when we award it a Good Deal rating. Check out the functionalities and join MyCruisewatch for free.